If you’re anything like me, and hate wasting soap, you’ll have plenty of soap scraps laying around the house from all of your melt and pour projects. I recently got a bee in my bonnet to embedded some of my old soap in one loaf mold (below) and chop up melt and pour scraps to integrate into a Cold Process loaf (above). I just love how they both turned out. The fragrance is even fabulous, though I will probably never be able to recreate it. Rats! 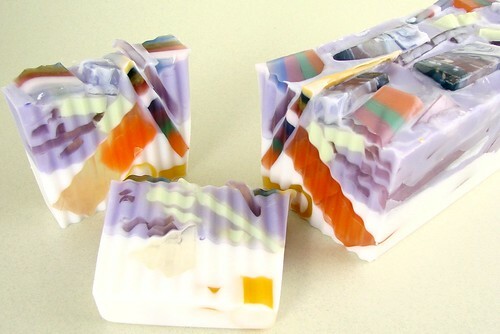 And another scrappy soap made with melt and pour odds and ends – each bar looks different and special. Two more scrappy soaps I did are shown on TwitPic here and here. Check out episode 4 of Soap Queen TV to see how I made the scrappy masterpiece above. Redgoddess, I can almost picture your scrappy soap in my head and I love the concept of the pure white providing contrast to the colorful multi colored scraps. Dramatic! 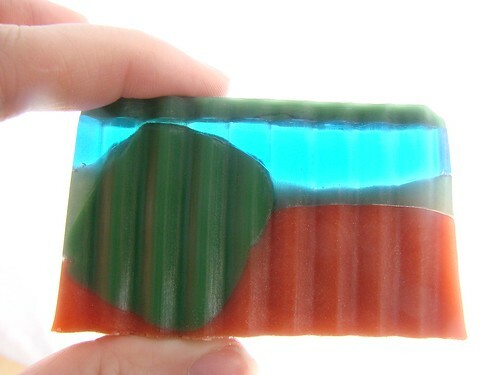 I made some scrappy soap twice. I had a huge amount of M&P scraps in a rainbow of colors. I made one large loaf with multi-colored scraps in white. It was spectacular! The other was done in clear and was really good, but not as spectacular. Currently, I'm saving more scraps to do it again. 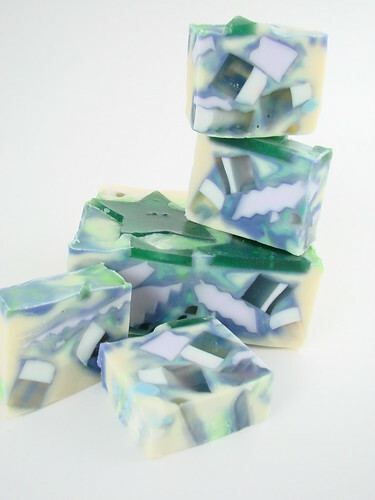 I have done 2 batches in the last few weeks of scrappy soap but used the swirling that was featured a few weeks. ago. Added some mica or glitter and they turned out pretty. 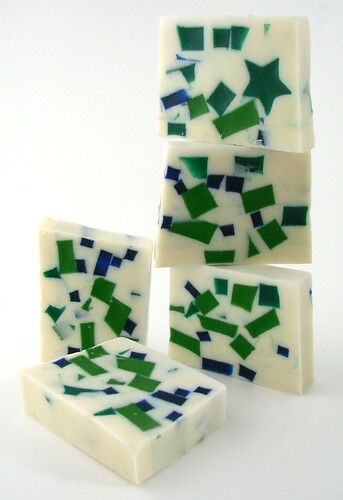 I love the adding scraps to new soaps idea! I've done scrappy soap before and I love it. I did have a problem doing it with cold process though (it didn't saponify correctly). It works better for me with hot process. I add in the chunks right before I'm ready to mold it. I haven't had much success making scrappy soap because I make mostly CP rather than M&P. Yours look so colorful and cheery, they're great! My scraps mostly end up being shredded into laundry soap flakes. Our clothes smell great and clean though! I don't think my scraps are as nice as yours (grin) but I'm gonna give this a try. cooool! I have so many scraps. Just the past day or so I've been giving making soap with scraps some thought. I shall now have a go after this! Are your scraps scented? All my scraps are usually 1 scent or another, so I'm usually scared to combine them all! these all look very lovely! you made scraps into something really cool! I love the episodes! So Cool! Technology is an awesome blessing.